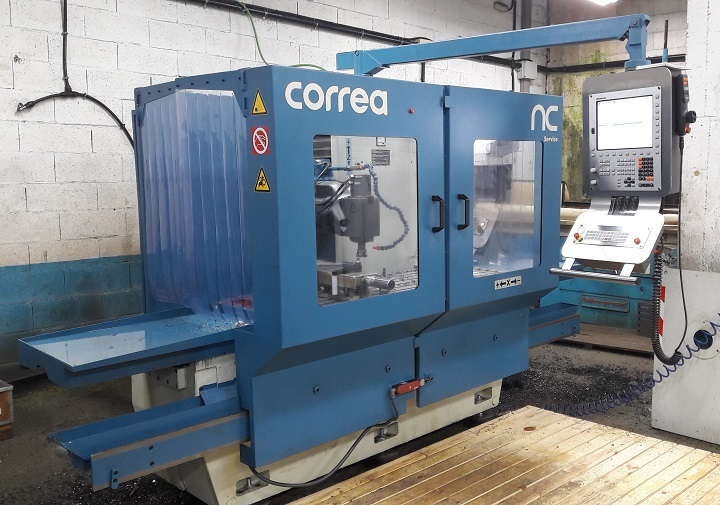 Nicolás Correa Service, S.A. has fully retrofitted a CORREA A10 bed type milling machine, by installing a new Heidenhain TNC-320 numerical control and new electrical control panel. The result is a milling machine which, despite being more than two decades old, has now been fully upgraded to 2017 standards, before being placed on the market. This bed type CORREA A10 is the smallest milling machine to be designed and marketed by Nicolás Correa. Characterised by an extremely robust structure and great rigidity, this machine is fitted with guideways with steel inserts and resin counter-guides on all three axes. It also features an electromagnetic brake on the spindle, which differentiates it from the next, higher level milling machine, namely the CORREA A16. Additional original key features of this CORREA A10 model include a universal head with hydraulic tool clamping, ball bearing spindles with a double preloaded screw and three high-resolution independent servo-drives. In its retrofitting process NC Service not only restored all the machine´s mechanical parts to like-new, but also technologically upgraded this CORREA A10 milling machine by installing a new Heidenhain TNC-320 numerical control, to replace the old TNC-155 that was initially supplied with the machine. A new electrical cabinet with new switchgear was also installed. The end customer for this milling machine was the Galicia-based company TECNOMICRA, who demanded a complete upgrade, in line with the company´s work philosophy and its ongoing commitment to the most advanced machining technologies. To sum up, this small, yet big milling machine with a travel of 1,300 mm on its X axis, and 630 mm on its horizontal and vertical axes, first built more than two decades ago, has been completely retrofitted before being put up for sale. With new upgrades and components, fully updated to today´s technologies, to become the ideal solution for machining small parts, offering the same quality and precision for which the CORREA brand is noted.